Unless you are buying multiple colors of cute, comfortable, and versatile ones like from Joan and David’s luxe series for seventy-five percent off, stick with one of each pair. The logic: with the unlimited supply of new styles there is plenty to buy that are unique enough to have you wearing them a long time and never missing out when you want more. There is no point to having something if you cannot easily spot it. 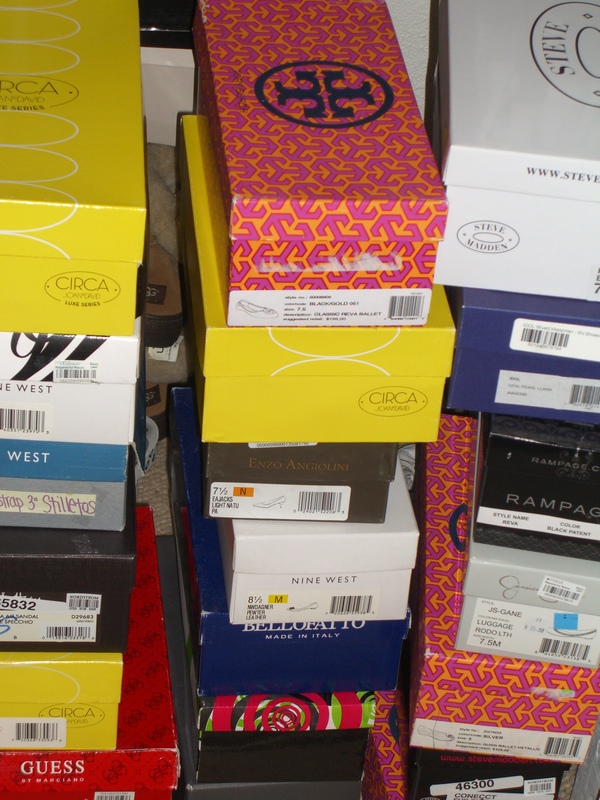 That means see through containers are necessary—or at least have labels on each shoe box with the model, style, and color. You may do this as easily as through affixed post-its, but be sure your writing is bold enough to read and also that all of the shoes are easily accessible. There was a time well after the dinosaur age when we had an instinctive response to fix things rather than buy anew. With the economic downturn and environmental concerns, reverting back to the shoe maker is becoming more attractive—and is a great way to rescue favorites. Just choose a merchant wisely and consider even testing a sample first. Many people stuff their closets with an unhealthy amount of footwear. So unless you have realistic sparing room—as in all are neatly in boxes or at least are in separate spaces, then for every new purchase give one away. Note: making space for new items by taking over your spouse’s closet is not an exemption to disposal. Chances are you never need another pair, but when you do likely get one, be smart. This means invest in line with both your budget and the occasion for use. Staying with Joan and David’s as an example, only purchase them if you a) will still have enough spending and savings money, b) will get multi-use from them and c) you absolutely demand them. Want more? Explore these relevant links: eHow’s How to Prolong the Life of Your Shoes (and be sure to scroll down for more parts to the series), About’s How Do You Organize Your Shoes? and HGTV’s Organization Tips. Also, what strategies work best for controlling your shoe collection? Help the community by sharing your ways below.